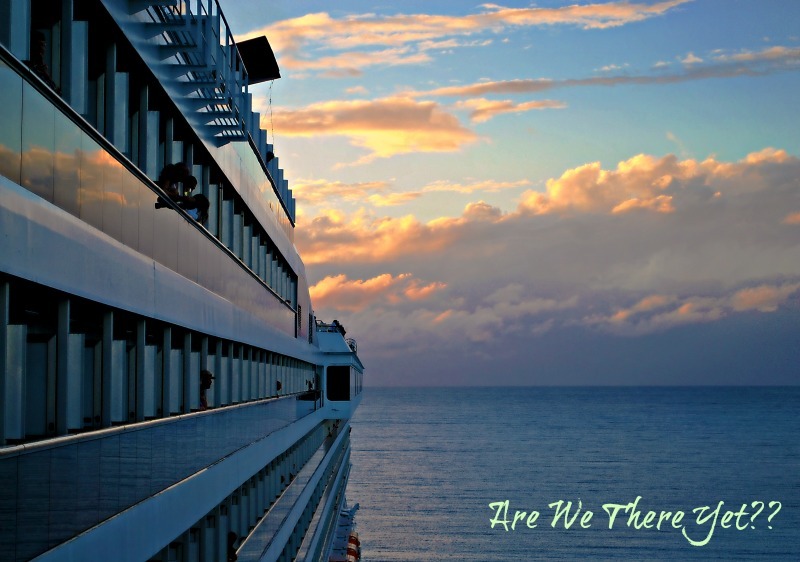 While checking my own blog stats last night, I came across a blog that I thought might be of particular interest to my Connecticut readers and I wanted to take the time to give it a shout-out while I go spend 16-hours telling ambulance crews where to go. Someone's got to do it, ya know, and I've been told a time or two that I'm actually pretty good at it. Plus it's National Telecommunicator Week and what better way to spend some of it then from behind a microphone being a telecommunicator?? At any rate, if you get a chance, go check out Connecticut Museum Quest - a blog whose goal is "Destroying the myth that there is nothing to do here". In reading over bits and pieces of Steve's blog, including the home page, it appears that he started his blog to log his visits to all of the museums in Connecticut. While he initally thought there might be 100 or so museums to visit, since starting his quest Steve has found out that there are upwards of 450 museums and/or places that might qualify as museums in our small State of Connecticut. Definitely enough to keep him busy for a long time to come! In addition to the museums he visits, Steve has also wracked up an impressive number of posts about what he calls "Curiosities" here in Connecticut which includes such things as The Birthplace of the Hamburger, The Best Free Cheesecake, The Oldest Public Park (in America), The Most Photographed Church, The Creepiest Old Prison Site, and - one of my personal favorites - The Coolest Cemetery. If Steve's goal is to try to get people more interested in exploring parts of Connecticut that they may never have heard of then it worked on me at least as I now have a rather lengthy list of places I want to go! As a matter of fact, his latest post The Oldest Seed Company in the US has me chomping at the bit to go check out Old Wethersfield before some idiot knocks the cool old buildings there down to build more commercially viable buildings. Steve's blog doesn't stop there, though, as there's also a Epherema page where Steve puts the random stuff that falls outside of what CTMQ is truly all about. On this page you'll find links to Modern Library’s Top 100 Books, 50 State Highpoints Project, and Wacky Beverages! All in all, a little bit of something for everyone it seems and I found myself reading post after post while making a longer and longer list of places to visit. Honestly, I think that the State of Connecticut needs to put Steve and his blog on its website as he's doing a darned fine job promoting the place and with people staying closer to home for vacations these days, his blog will point them in some interesting directions. Don't just take my word for it - though I certainly wouldn't lie to you! 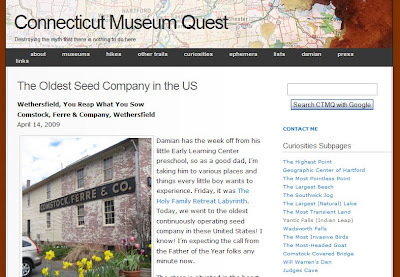 - go check out Connecticut Museum Quest and then feel free to come back here and tell me that I was right, I don't mind! When I lived in Ohio I was amazed to find out that the Cleveland Area was Connecticut's Western Reserve. When the states were land hungry and dividing up the known land, Ohio belonged to Connecticut. Ever been to Williamsburg? Virginia extended all the way to the pacific Ocean on one of their maps. Maryland on the other hand has always looked like Maryland. Happy National Telecommunicator Week. What you do is so important to our lives and the lives of those we love. What a cool blog. I'm thinking every state needs someone like Steve to help promote the little known places of interest for visitors and residents alike. Lots of work but definitely worth the effort. I went over and I'll go back. It is a fascinating site with lots of great info and trivia. Thanks for the lead. Great on the new history adventure. I'm sure you will find lots of new places to visit and report on. Wow, thanks for the kind words, Linda. You pretty much nailed my little blog in your post. We have similar interests - I noticed your post on the "oldest railroad tunnel in use in the US." Now THAT'S CTMQ worthy stuff! I'll check it out someday. I'm glad a few non-Nutmeggers have stopped by CTMQ and have perhaps found we're not so boring here after all! What Lois and Sandee said. I'll go over to Steve's and poke around. I want to know where to get the best Free Cheesecake! yeah...he pretty much needs to rename his blog "Places for Linda to visit and take pictures"
seriously...it looks like a great weblog...full of wonderful places and interesting information. Really super stuff! I've lived here all my life and have never been to the La Brea Tar Pits - or the Huntington Library. Shame on me! How cool. I will check out Steve's site. Thanks, Duchess for the info.